4 again. The Col ordered Capt Chapman to find out who made the threats. Chapman had the Co on parade and every man denied making the threat. The Col then ordered the Capt to put his men under oath. This the Capt refused to do. He then ordered him to put them on their word of honor as men, and soldiers. 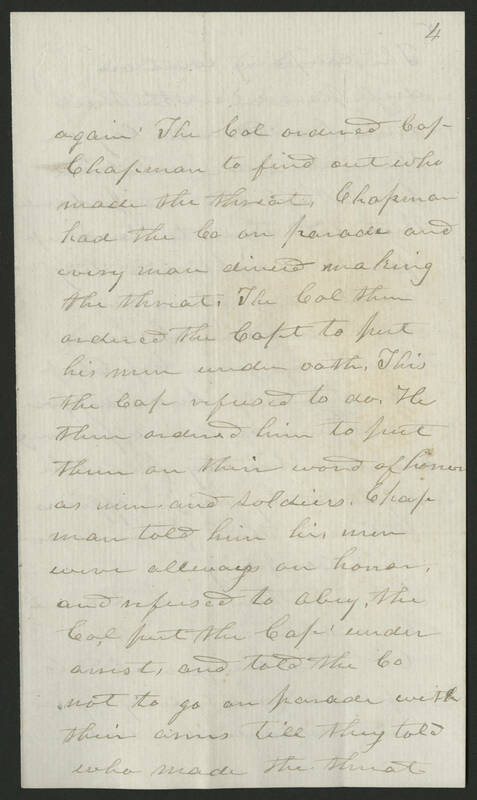 Chapman told him his men were allways on honor, and refused to obey. the Col put the Capt under arrest, and told the Co not to go on parade with their arms till they told who made the threat.